May is the month of Mary, with special significance because this year is the 100th anniversary of the Fatima apparitions! Here are some fun, educational & printable ebooks to celebrate Our Lady’s month! Holy Rosary eBook - 20 artworks of the joyful, luminous, sorrowful & glorious Mysteries of the Holy Rosary. Jesus’ Family & Friends eBook - 24 artworks of Jesus, Mary, Joseph and many other close friends of our Lord. 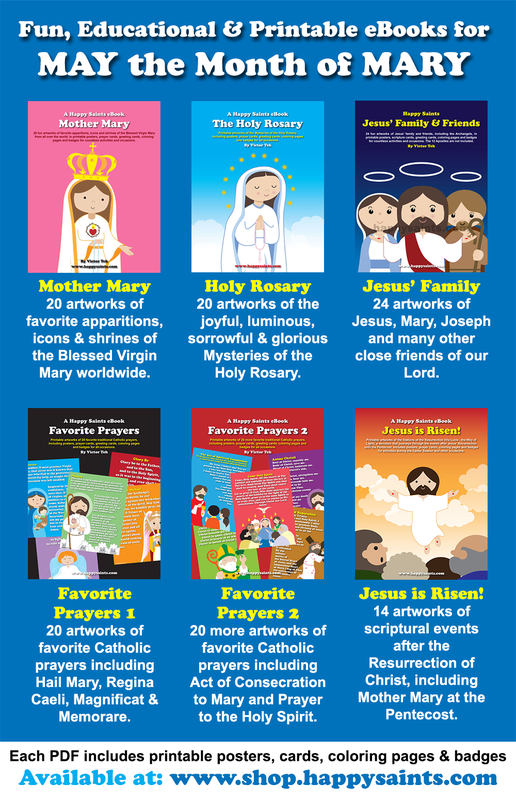 Favorite Prayers eBook 1 - 20 artworks of favorite Catholic prayers including Hail Mary, Regina Caeli, Magnificat & Memorare. Favorite Prayers eBook 2 - 20 more artworks of favorite Catholic prayers including Act of Consecration to Mary and Prayer to the Holy Spirit. Jesus is Risen! eBook - 14 artworks of scriptural events after the Resurrection of Christ, including Mother Mary at the Pentecost.